I think the term is meant to be an exaggeration, and a play on ‘militant christians/muslims/whatever.’ I also think it’s one of those terms that got used a couple times and then caught on by people not really thinking about its usage. 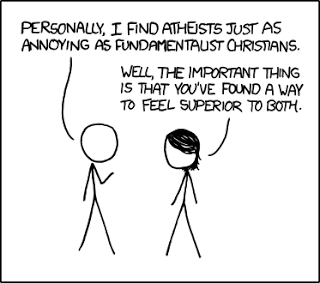 I would like to see the term ‘antitheist’ used more to distinguish between those who simply do not subscribe to theism, and those who are bent on disproving or dismantling it. I think it can be used in that sense, and is sometimes used by atheists who want to add some ‘edge’, or emphasise how strongly they feel. My concern is the way it often gets used by Theists.. I like the term antitheist, not heard that before. It usefully distinguishes athiesm:”absence of belief in god” from the rarer position of antitheism: “negative view of theism”. I am an antitheist on that definition: i don’t just “not believe in god”, i think belief in god is a counterproductive belief. I have a strong position but that doesnt make it an aggressive position.